Baby's coming home ensemble. I had so much fun doing this. Just the sweetness of it about did me in. How can you go wrong with whisper soft pink, sweet lace and just a touch of embroidery? Pattern is Emma's Smocked Baby Dress. This pattern goes together without a hitch. I love it. 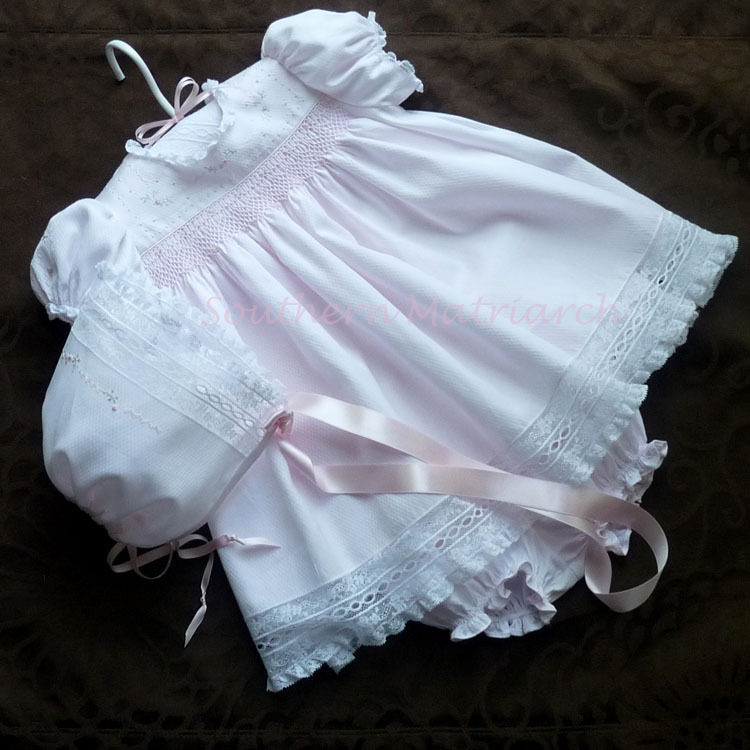 I was telling Jeannie at OFB that I want to try and make a bubble version of this little dress I love it so much. I love the back as much as the front. Just sweet. Anyone that knows me, or has attended convention with me, knows I have an extensive collection of mother of pearl buttons, also from Old Fashioned Baby. Jeannie's website does not do justice to number of baby buttons she actually has. Well she has less than she used to because I have a basket full upstairs. 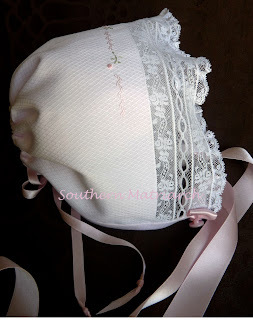 I did a sort of modified version of one of the bonnets from The Christening Bonnet Collection. Both patterns are from The Old Fashioned Baby. Mommy isn't crazy about "fru-fru" bonnets, so this tailored version fits the bill. 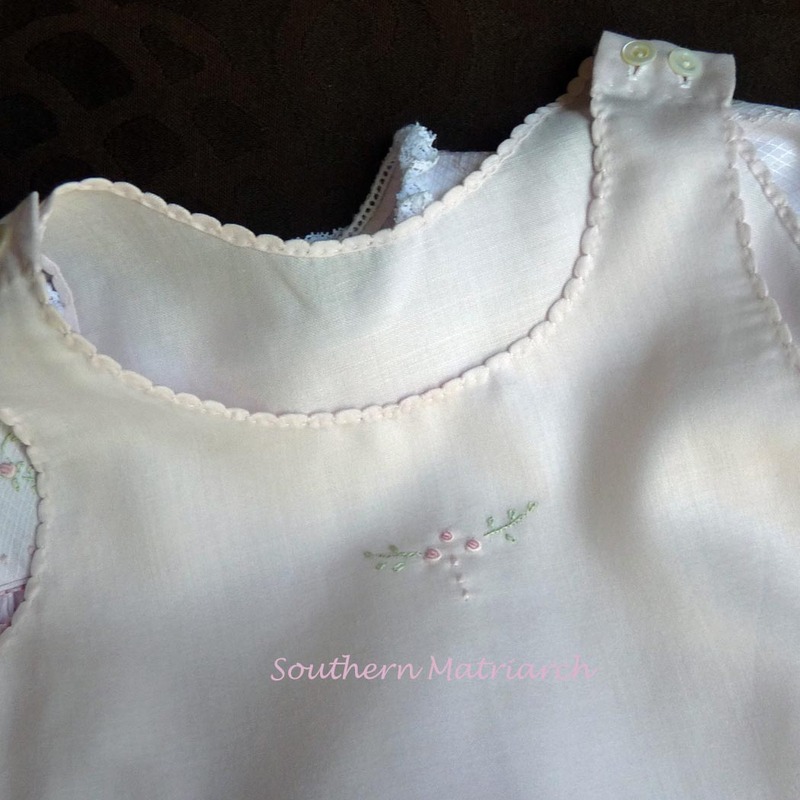 A tiny bit of embroidery to match the dress bodice finishes it off. The fabric is Sea Island Diamonds from Bessie Mary. I have a serious love affair with this fabric. I LOVE tone on tone anyway, but the diamonds have a soft sheen to them that is just enough contrast. 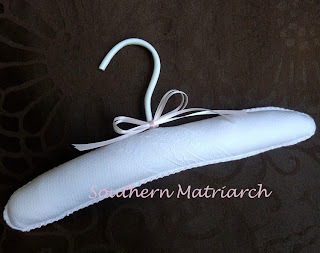 Plus the more you handle this fabric the softer it gets. It has almost a velvety feel to it after a couple of washings and handling it during stitching and construction. Jan also has it in blue. I may have to have some blue. It might be a bit pricier than you might normally spend on a yard of fabric, $22/yard. But....you can get all four of these pieces from one yard of fabric!! There are even some scraps left. It is 60" wide so it goes a long way. Of course an obnoxiously possessed Mimi makes a matching hanger. (I know, its a sickness.) Pattern is from Lyn Weeks but there is also one in Australian Smocking and Embroidery Issue #76. The little diaper cover is also from the same issue. Any proper young lady needs a slip. (Something all three of my girls seem to have forgotten.) The fabric is satin batiste. Again from Bessie Mary. 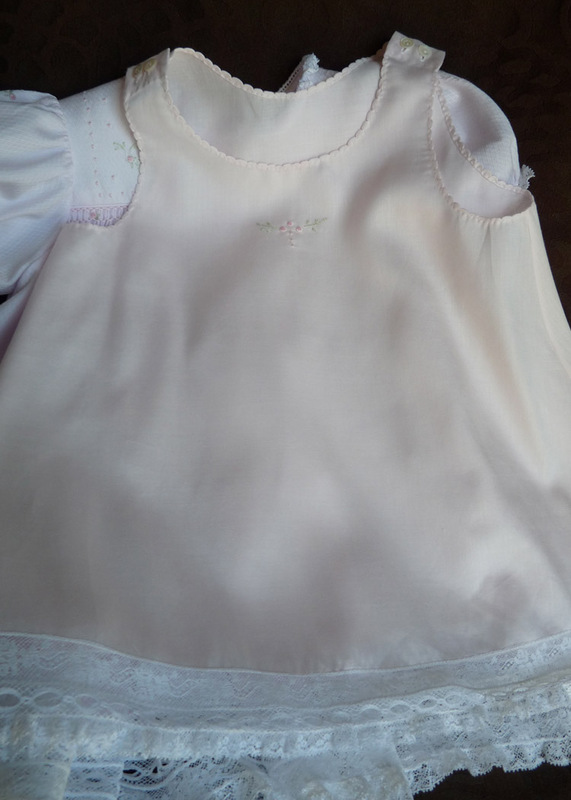 It looks peachy in this picture, in real life it is much pinker and almost a perfect color match for the dress fabric. I finished the arms and neckline with a shell stitch hem and just a quick touch of embroidery. I did add just a smidge of German Interfacing to the shoulder facings where I stitched the buttonholes. I have better success with my buttonholes in that tiny space when I do that. And of course some mother of pearl slip buttons. Since the lace, buttons and patterns were in my stash I only spent $30 for this outfit. Not bad if you ask me. She is going to be so pretty in her pink dress. I'll be home soon with pictures and report of my trip to Avery Island. 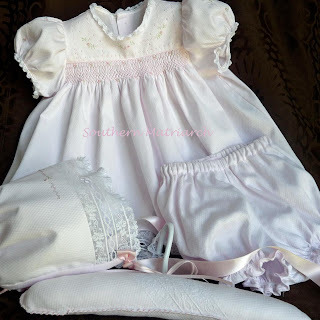 What an incredible perfect, exquisite Coming Home ensemble for your anticipated granddaughter, Martha!!!!! Can't wait to see pictures, just as you can't wait to meet her! Beautiful! Breath taking! Just love it! The only thing missing is the baby! The little ensemble is perfection in pink! What a beautiful outfit! I especially love that fabric - I'll have to get some! Can't wait to see the baby in it. I saw this on Flickr a couple of days ago and were hoping you would post here and let us know all the details. It turned out just perfect!! Absolutely beautiful!! This is all so sweet and precious I can hardly stand it!!!! Makes me wish my two little grands were that small again!!! Absolutely gorgeous! Thank you for sharing all the wonderful details of this gorgeous ensemble! Beautiful. What a lucky baby to have such as talented Mimi!!! Perfect! I had no doubts it would be any thing but perfect. 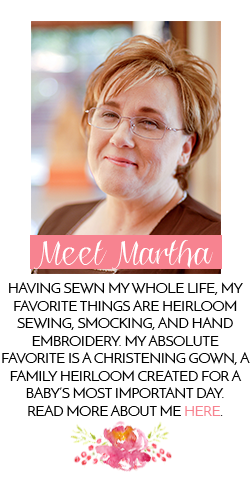 You did a wonderful job, Martha. The entire ensemble is beautiful, perfectly made. 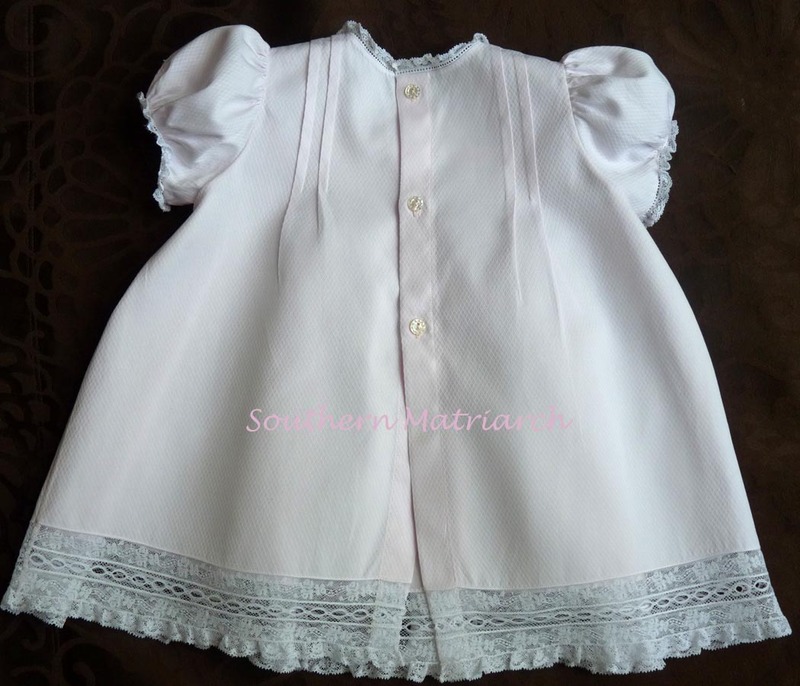 I cannot wait to see it worn by your beautiful baby granddaughter. That is a perfect coming home outfit! I will say I will be different from everyone else and I can wait to see her in it. :) She needs to stay put for a few more weeks. I am making a coming home outfit for my niece and this is the one! Did you have to make any modifications in the smallest size to fit a newborn. I have made a few bishops for newborns before and they are always huge! Emily I did not change it at all. It was a tad generous on her but not overly so. And yet she wore it until she was three months old.I love this pattern.